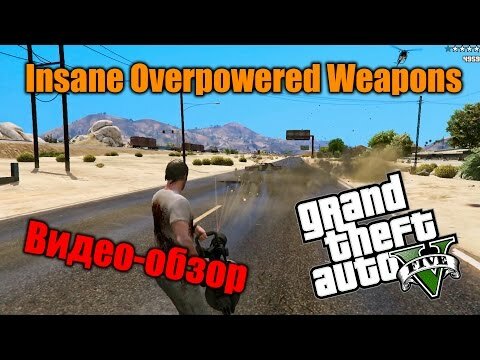 Insane Overpowered Weapons mod 2.0 is a mod for GTA 5, which greatly increases the power of weapons available to you. 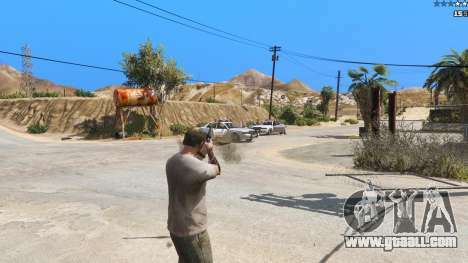 With this mod no one in the world of GTA 5 will not be able to compare with you in firepower. Baseball bat after the shock sends foes in the last flight. 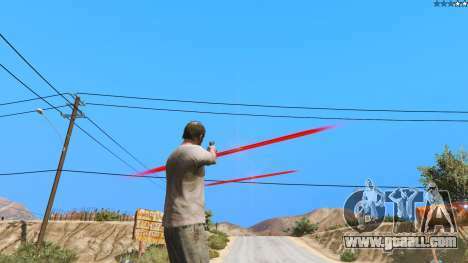 Piercing gun: shoots farther and faster, the force of the bullets is enough to move the car, shoot 4 bullets per shot with minimal scatter. Removed cooldown. Assault rifle: it shoots farther and faster, easily destroys the machine, produces 6 bullets per shot with small scatter. Removed cooldown. Combat gun: shoots farther and faster, destroying cars, 2 bullets per shot, without scatter. Removed cooldown. Micro SMG: same - shoots farther and faster, destroying cars, 2 bullets per shot, without scatter. Removed cooldown. Sniper rifle: shoots faster, ultra-range, destroys the machine and any opponent with one shot, very fast reload. Assault shotgun: shoots faster, farther, destroying cars and helicopters in one or two hits, produces 150 bullets per shot and has no cooldown. 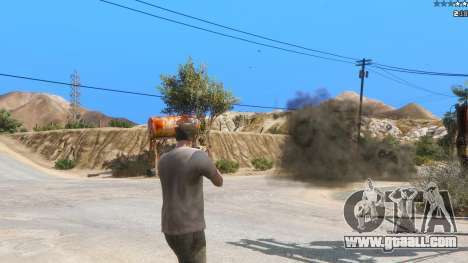 Grenade launcher: shoots faster and farther, stronger explosions. A Gatling gun: shoots faster and further annihilate any technique that produces 8 bullets per shot and has a rate of fire of 400 rounds per minute, has no recharge. Use with caution: may lead to crash the game due to the abundance of special effects. Heavy sniper rifle: shoots farther and faster, destroy equipment, produces 50 bullets per shot with small scatter. Shotgun ultra-long-range action. Pipe bombs: flying farther explodes more powerful. Improved rifle shoots grenades instead of bullets, no reload. 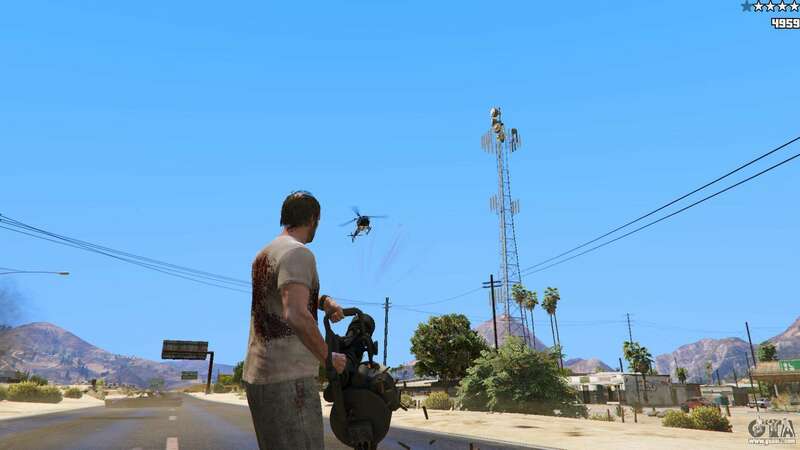 RPG - the projectile flies faster and farther, with a cooldown of about 0.1 seconds. Combat pistol - shoots Molotov cocktails instead of bullets, the firing rate depends on the speed of your clicks with the left mouse button. No reloading. Bleed - produces 200 bullets per shot with great diversity, great rate of fire, no reload, slightly increased range and power of fire. Gun.50 - shoots RPG projectiles instead of bullets with a very high rate of fire, increased range and power. Easy to shoot rockets from inside the van. 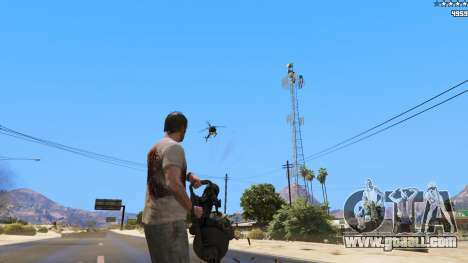 In order to download the mod Insane Overpowered Weapons mod 2.0 for GTA 5, just follow the links on this page.